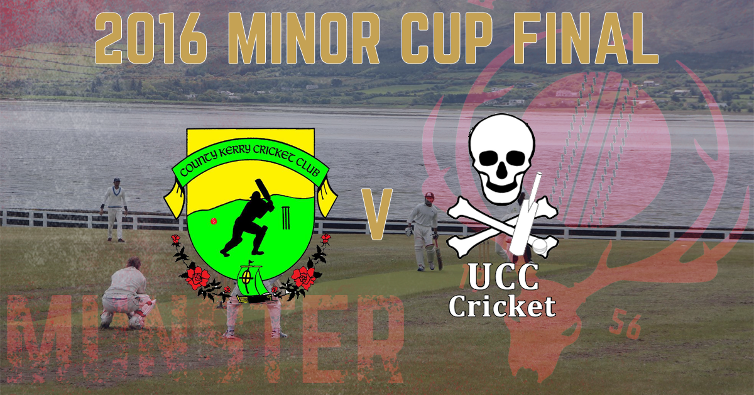 The 2016 Minor Cup Final sees County Kerry Cricket Club take on UCC Cricket Club at The Oyster Oval on Saturday. The fixture will mark the inaugural Cup Final to be hosted at the impressive new venue near Tralee following its opening at the start of the 2016 season. Saturday’s game will be the first time these two teams have faced each other this season, with a fixture mix-up forcing their Division 2 game in June to be postponed, and it will be fascinating to see how the pair match up on an excellent wicket near Camp. Kerry beat Cork Harlequins by 6 wickets in their semi-final while UCC had a shock 5 wicket defeat of Limerick to progress to Saturday’s final. County Kerry had a tough route to the final with away fixtures at both the Quarter and Semi Final stage against Cork County and Cork Harlequins, respectively. An impressive 6 wicket victory over Harlequins at Farmers Cross in the Semi-Final saw the Kerrymen through to a Final at their home ground. Kerry will be hoping Shiva Katta will be in form with the bat on Saturday, who top-scored with 78 against Cork Harlequins in April. Katta has proved himself to be an extremely consistent performer for the Kingdom side, and he will be UCC’s main threat at the Oyster Oval while Owais Saghir’s crucial 61* won the Kingdom side the semi-final against Quins that day. For UCC, Kevin O’Sullivan’s consistency with both bat and ball has been instrumental to their form, with seam bowler Abdul Razzaq’s ability to take key wickets often extracting the Students from tight situations. Danyal Siddiqe hit a 50 in their shock win over Limerick in the semi-final at Adare, and his wicket-to-wicket bowling also keeps things tight for the Corkonians. The action is scheduled to start at 1 p.m. so if you're in the Tralee area then why not pay a visit to the picturesque surroundings of The Oyster Oval to see who will claim the 2016 Minor Cup.